On 6th April, 2017, the RBI released 1st Bi- monthly Monetary Policy Statement, 2017-18 following the approval from Monetary Policy Committee (MPC) to be effective between 1st April, 2017 and 31st May, 2017. The 6th Bi-Monthly Monetary Policy Statement 2016-17 was released by RBI on 8th February, 2017. The Repo Rate under the Liquidity Adjustment Facility (LAF) remained unchanged at 6.25 %. These rates under LAF determine the corridor for short-term money market interest rates. In turn, this is expected to trigger movement in other segments of the financial market and real economy. The Reverse Repo Rate under the LAF increased by 25 bps from 5.75 % to 6.00 %, thus reducing the difference between Repo and Reverse Repo to 25 bps from the existing 50 bps. These rates under LAF determine the corridor for short-term money market interest rates. In turn, this is expected to trigger movement in other segments of the financial market and real economy. The Marginal Standing Facility (MSF) Rate reduced by 25 bps from 6.75 % earlier to 6.50 %. It is a benefit under which Scheduled Commercial Banks can sharpen Additional Amount of Overnight Money from the Reserve Bank by dipping into their Statutory Liquidity Ratio (SLR) portfolio up to a limit of 2% of their Net Demand and Time Liabilities (NDTL) deposits at a penal rate of interest (currently 25 basis points above the Repo Rate). MSF appreciated a Safety Valve against Unanticipated Liquidity Shocks to the Banking System. Bank Rate reduced by 25 bps from 6.75 % earlier to 6.50%. Bank Rate is the rate at which the Reserve Bank is ready to Buy or Rediscount Bills of Exchange or other Commercial Papers. Under Section 49 the Bank Rate is published of the Reserve Bank of India RBI Act, 1934 and is considered as the oldest key policy rates adopted by the RBI. Cash Reserve Rate is the share of net demand and time liabilities that banks must maintain as cash balance with the Reserve Bank. Other Reserve Requirement for Commercial Banks including Regional Rural Banks that is SLR has been remain unchanged at 20.50 % with effect from 7th January 2017. 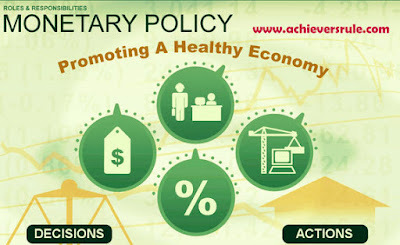 The 2nd Bi-Monthly Monetary Policy Statement will be reviewed by Monetary Policy Committee (MPC) on 5th June 2017. The Monetary Policy Committee chaired by Reserve Bank of India Governor Urjit Patel has, in fact, decided to raise the rate at which the central bank borrows funds from banks by 25 basis points from 5.75% to 6%, while leaving other policy rates untasted. This marginal change is aimed at sucking out from the system excess liquidity that remains a lingering concern, despite coming off its peak in the aftermath of the demonetization exercise. In the economy this year the RBI is quite optimistic about an uptick projecting 7.4% growth in Gross Value- Added, compared to 6.7% in 2016-17. In the coming days the RBI has reminded the government there will be “clearly more demand for capital”. The government’s allocation of Rs.10, 000 crore to recapitalize public sector banks is obviously inadequate. RBI will unveil a new Prompt Corrective Action framework to need urgently resolve the surge of bad loans on bank books in the middle of this month. While banks have waned lending rates the RBI has pointed out there is room for more cuts if rates on small savings schemes are reformed. In Uttar Pradesh the government must not disregard Mr. Urjit Patel’s’ categorical call to shun loan waivers of the kind just declared. The RBI has recommended that Banks be allowed to invest in Infrastructure Investment Trusts (InvITs) and Real Estate Investment Trusts (REITs) following the approval from the Capital Market Regulator SEBI to improve their Asset Class. The maximum limit of investment capped at 20 % of the Net Owned Funds (NOF). The Surplus Liquidity in the Banking System declined from around Rs. 7 lakh crore on 4th January, 2017 to Rs. 6 lakh crore in February 2017 and further down to Rs. 4 lakh crore in March 2017. Further, the hike in Reverse Repo Rate was implemented to absorb current liquidity overhand in the Market. The Central Bank intends to keep Managing Liquidity via Market Stabilization Scheme (MSS) and Open Market Operation (OMO). The Market Stabilization Scheme is a Monetary Policy Intervention by the RBI to withdraw excess Liquidity by Selling Government Securities (G-Secs) in the Economy. MSS was introduced in April 2004 with an aim to withdraw excess liquidity or money from the system by selling Government Bonds/ Government Securities.